The day-to-day struggles of John Adams in the late 18th century are not exactly attention-grabbing. Sweating to death in the Philadelphia Congress, endlessly debating the issue of American independence and lamenting a long-distance relationship — in theory, no combination of these parts should create an even semi-enjoyable musical. But the underpinnings of U.S. politics, the harsh reality of the struggle for freedom and the historical narratives that still echo today manage to transform John Adams’ life story into the Tony award-winning musical “1776,” which New Repertory Theatre in Watertown brought to life Monday. When “1776” first debuted on Broadway in 1969, critics were sure the show would flop. Multiple production companies and venues turned down the musical, and who could blame them? 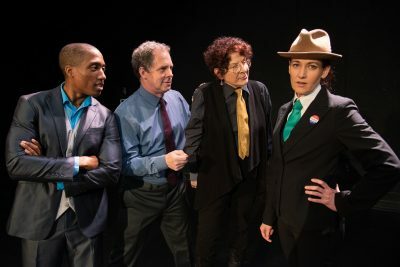 With the recent election of Richard Nixon and a highly unpopular war waging in Vietnam, it seemed unlikely that a deeply politically divided nation would be particularly fond of a theatrical production lauding the accomplishments of the founding fathers. However, the show was a hit across party lines once it eventually debuted. It even earned the praise of Nixon himself — after he forced the omission of the musical’s most critical song. It could be called a logical move, considering he himself would qualify as one of the “Cool, Cool Conservative Men” that the musical heavily criticized. Now, nearly 50 years later, “1776” debuted at the Mosesian Center for the Arts’ New Repertory Theatre in a similarly polarized nation, one which some argue is divided at an unprecedented degree. The production, which opened Nov. 30 and will run through Dec. 30, boasts a cast of seasoned performers and directors of a caliber clearly up to par with the high standards of the Boston area’s local theater scene. With its Revolution-era America plotline and setting, glorification of the founding fathers and dramatization of objectively boring congressional proceedings, “1776” has clear parallels to “Hamilton.” Miranda has expressed various times that his musical draws from its predecessor, but in a critically evolved way. Whereas “1776” presents musical numbers interspersed between long bouts of dialogue, the infusion of rap, hip-hop and nonstop musical numbers in “Hamilton” modernizes musical theater to a previously unheard of degree. This leads to the inevitable timing misfortune of New Repertory’s “1776.” Compared to the pop culture phenomenon of “Hamilton,” nothing even remotely similar can compete. The riveting performances of Benjamin Evett and Carolyn Saxon as John and Abigail Adams are lost in the monotony of dialogue, just as Broadway star Shannon Lee Jones’ chilling performance of “Molasses to Rum” as Edward Rutledge is bookended by discussions that even C-SPAN would consider boring. The one truly striking aspect of “1776” was the diversity of its cast. Taking multiple steps further than even the critically-lauded racial diversity of “Hamilton,” which is no doubt a factor in this casting decision, the 21-person company featured 10 female and 10 non-white performers. Actors also greatly ranged in age, with Boston University College of Fine Arts student Alex Hatcher performing alongside local theater veteran Bobbie Steinbach, whose Benjamin Franklin walked the perfect line between hilarity and obnoxiousness. However, the performance did run into trouble in some instances. New Repertory’s Thomas Jefferson, played by the phenomenal African-American actor KP Powell, appeared unnatural in his discussion of slavery and accusation of racism. Daveed Diggs’ rendition of Jefferson in “Hamilton” faced similar difficulties. Despite the outdatedness of the musical’s organization, the messages and themes presented are more relevant now than ever before.